Headlines Fishing has been fantastic overall. 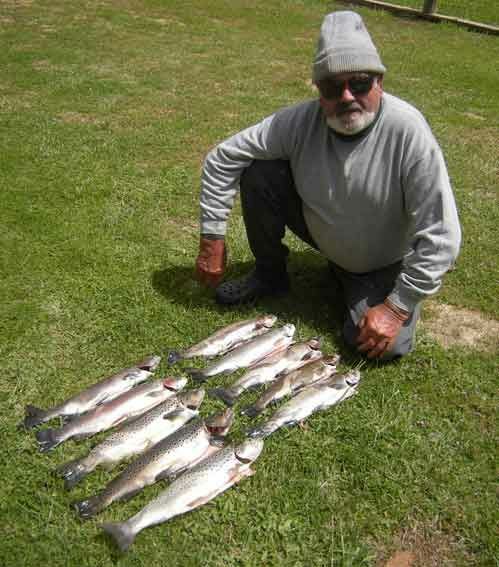 Lakes have been fishing very well with many options as far as locations are concerned Good rain has fallen over the past week and there is plenty of good fishing water in the rivers. Rivers:- Despite being a little high on the weekend rivers have still fished well with dries and emergers being great patterns. Nymphing has excellent too when conditions have been a little rough. 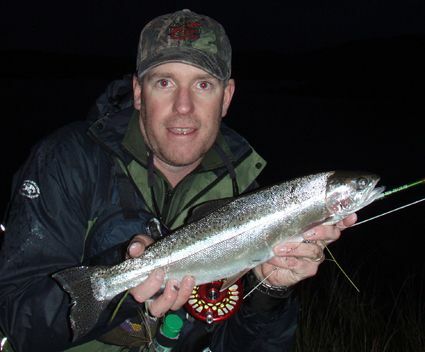 The Eucumbene river has been great with some good rainbows being taken. They can be a little spooky at times, perhaps not surprising given the number of anglers they have seen in the past month, but have still been catchable. Browns have been starting to move a little more off the top on the right day. 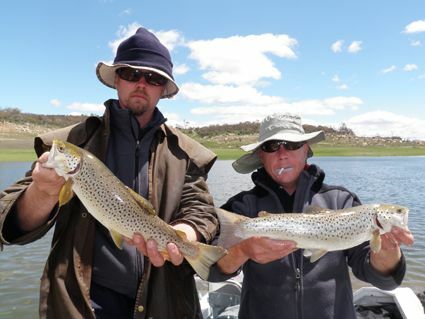 The Thredbo has been similar with some good fishing early and late in the day. There have been some termite falls in the past week so a few ants in the box would be a good idea at present. Other patterns to have would be klinkhamer, Adam's midge, Black and brown beetles. Lake Eucumbene:- The lake has risen a little early in the week and should provide some nice fishing for the next couple of weeks. The lake has already been fishing very well with some good browns and numbers of rainbows playing around in close when weather is good. Weather has played a huge part in the action on the day though. There have been some good eveing rises and also enough fish to be caught just searching though the day. Beadhead nymphs fished quick or a small black and peacock, stick caddis, or midge pupa fished slow are great searching patterns for the rainbows. Small emergers on dark will undo some of the fish that are on adult midge or emerging midge. Evening rises have varied but with some calmer warm weather we should see improvement over the week. *Stuart Sturgeon caught this well conditioned brown on a midge pupa last week amongst some other nice rainbows and browns. *Ivan Maric from Sydney had a good evening session in the lake this week hooking thirteen fish and landing eight of them in and evening session. He followed this up the next morning with a nice brown around the 1.5kg mark. The fish were caught on a flashback nymph. *This 47cm rainbow also fell to a supa dupa pupa recently at the lake. 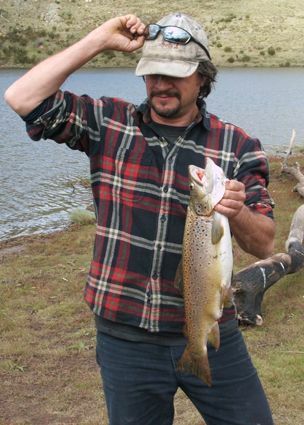 Fishing is excellent in the Middilingbank, Seven Gates and Old Adaminaby areas. 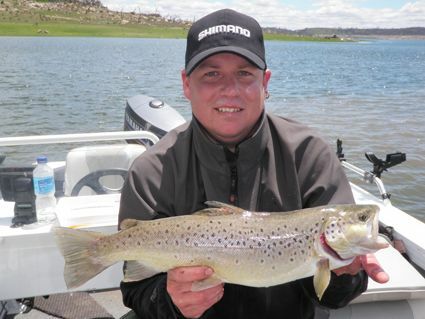 Lake Jindabyne:- Jindabyne reports have improved a little with some nice fish being caught, though weather is playing a big part at present. Some good browns have been reported in some of the grassy bays with woolly buggers being a good fly to use on these large cruisers. There have been a few nice rainbows around and also some brook trout and atlantic salmon being caught. There would be a good chance of a Jindabyne grand slam at present. Water levels have not changed a lot in spite of recent enviromental releases and this has helped the fishing tremendously. Lake Tantangara :- A few very nice quality fish have been reported but not much in the way of numbers at this stage. Reports suggest that the fishing has improved over the past week. 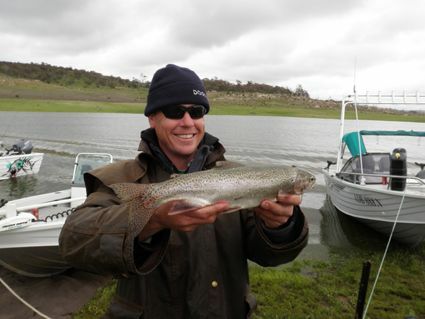 Eucumbene:- Eucumbene trolling reports have been good with most trollers reporting a few small rainbows. There have been a few good browns caught ast well and it sounds like you have to target them a little bit harder with larger minnows in slightly deeper water. Tassies and Lofty's have been good with pink, pink and purple and Y90 being some colours that have stood out. New Rebel Tracdowns have come into stock and these would be a great lure to try on some browns or rainbows this week. *Jay Allen, Dan, Dawson, James Medway and Matt had a good week during the Trout Festival with a mixed bag of fish. Just shows that with perseverance even in average conditions there are fish to be caught. Below James with a 2.4 kg brown. 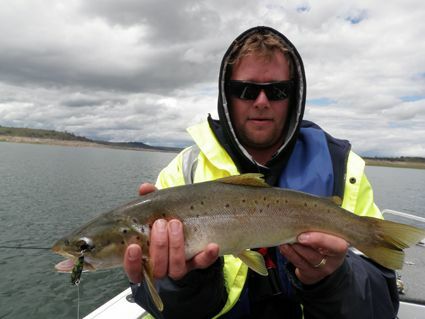 Jindabyne:- Trolling reports have been fairly good with some fish being caught flat, on lead and downrigging. *Jim and Geoff caught these very nice fish downrigging recently. Nice quality browns. Best areas to try have been kalkite and waste point area and also off sid's bay. *Tantangara has also trolled well over the weeknd with lots of smallish browns. The larger fish are there too so this little lake would be worth a look currently. Mudeyes are availabe at time of writing and have been starting to score a few fish. The new Gulp Crickets are now also in stock and will make a great bait under a bubble. They look just like a mudeye so with a few colour choices and built in scent it would be amazing if they don't account for a few feisty rainbows and browns in the lakes. *Johnny Scrubworm and his mate with their catch taken during the trout festival. Some good eating there. Cobrabald, Wangrabelle, Homeleigh Bay and the Dam wall. 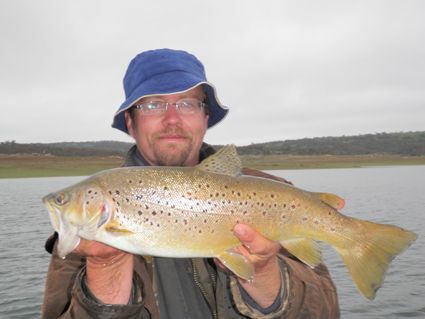 Tantangara has been fishing well for some, Rory McQuinn sent this photo in of a five and a half pound brown that his mate, Shane Senini caught on a scrubworm. Two other fish of similar proportions were also caught on the day. Powerbait and Scrubbies have been excellent though keeping on the hook has been a little tough for some. It is fantastic just being at Jinde with the water so high. 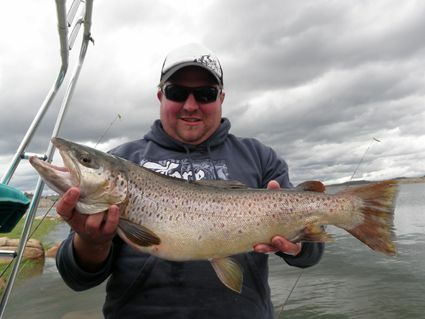 Some atlantics have been caught this week and some nice browns and quality rainbows are also on the go.